Confession: I have a Harvest Moon problem. Not currently, actually, well, not technically, but if I were to get started playing it, I probably would have a problem again. Did any of that make sense? Okay, story time. When I was in high school I had these two friends, Jac and Josiah, and they were super into Harvest Moon and emulators. 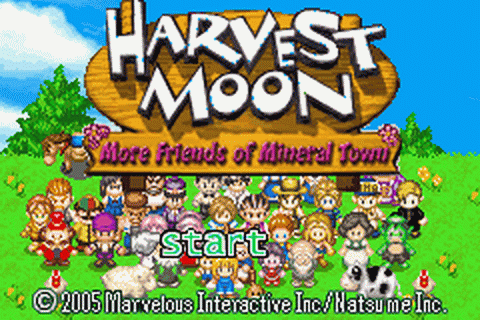 I had an emulator on my little laptop for playing Pokemon, and I remembered seeing a friend play Harvest Moon way back in the day on an N64 and I was like, you know what? I should totally try it out, it looked like a lot of fun. And it was… and it kept being fun for the foreseeable future. I wish I could explain why I love Harvest Moon so much. I think it’s for the same reason that I love Sims. It’s a little tiny baby open world game; you farm how you want, have as many animals as you want, mine and fish as you please and interact with the people in the village as much or as little as you desire. You can be friends with anyone you want or don’t want, but it’s not overwhelming. You always now what you have to do and the choices are limited enough that you don’t feel lost. I don’t feel lost, I should say. I have trouble with big open world games like the Elder Scroll games and Fallout. I tend to feel lost as soon as I get out of the tutorial. Sure I can talk to people and they’ll send me on quests to do this or that, but I never have any idea where I’m supposed to go or what I’m supposed to do to accomplish what they want me to get done. I get lost super easily and don’t know where I am or how to get back. Harvest Moon is like an open world game with a little baby map that I can learn super quickly and people who don’t send me on quests unless it’s to give them something, or bring something to a festival. If you’re not familiar with it, Harvest Moon is a farming game. The basic premise of every Harvest Moon game is thus: you’ve inherited a farm from someone (kindly old man, grandfather, etc) and you’ve come from the big city to check it out. The mayor welcomes you, tells you about shipping and the people in town and wishes you luck taking care of the rundown property. From there the plot is as you make it. You clear brush and debris to get resources and space to farm, you plant and sell crops to save money to get chickens and cows, you work the farm. Outside of the farming you can also mine, fish, forage, and make friends with the people in the town, specifically with the eligible guys and gals whom you can choose to marry if you like. There are festivals to go to throughout the year and prizes for doing well at some, or just fun to be had at others. The goal is to build up the farm, get married and have a kid and you can play through as many years of farm life as you so desire. The first Harvest Moon game was for the Super Nintendo and had this very basic plot, or lack there of, I guess. Since that first game there have been many more under the Harvest Moon title, several spin-offs, and a name change to Story of Seasons, which I totally missed somehow. As time progressed the games started to form their own quirks and goals within the game. The games started to present challenges to work on while farming and friend building. Sprites became people to discover as well as helpers for hire. DS and DS Cute sent you on a quest to find release the sprites through different accomplishments in the game: 100 fish caught, 1000 items shipped, milking your cow for the first time, etc. It made the game a little more interesting and gave you something to do beyond the goal of marriage. I think you were trying to free some goddess by getting all the sprites, but I can’t remember for sure. My favorite part of any Harvest Moon game is generally the wooing. The girls you can marry change slightly from game to game, but there is a standard five that appear in many, if not most of the games. 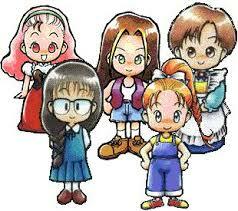 Ann, Karen, Mary, Elle and Popuri, and they tend to embody one stereotype or another. Ann is a tomboy who likes to eat, Popuri is a super frilly girly girl, Mary is a bookworm, Karen is rough around the edges, Elle is the sweet nurse. I have successfully wooed and wed Elle, Mary and Karen in various games. There are also girl versions of some of the games in which you can woo the guys as well, but the guys seem to change more than the girls. To woo your intended you have to give them a lot of gifts and talk to them every day. This is true of anyone you want to be friends with, but the villagers you can marry will have a little heart by their name when you talk to them. This heart is your indicator of affection and will change color based on how much they like you. You’ll go through a “heart scene” for each color in which you interact with the object of your affections in a cut scene and learn more about them and their past or their feels about things. These make me happy as they are often very cute. I’ll admit it, I’m a bit of a romantic and I like the sappy parts of the game. The people interactions are all fun in general, though. The more you talk to anyone the more familiar you become with them and their standard dialogue changes to reflect that. It’s pretty cool to build relationships with the people in the town and learn about each of them. You also have rivals for each of the eligible villagers who you can stumble upon cut scenes for. If you see all their cut scenes I guess they get married. I always kind of wanted to set someone up, get to be really good friends with one of the couples I didn’t want to marry and see if I could get them together. I could never find all the cut scenes, though. I should try again now that I have more patience. All the games have lots of mini games. Usually fishing has some trick to it that makes it harder to catch the more valuable fish. Often the festivals are a mini game or a challenge. There’s a cooking festival usually where you have to cook something that will be judged against some other villagers dishes. There is sometimes a horse race that you can bet on or participate in. I’m never very good at those. One game I played had a mini game with your dog and a Frisbee. Some of them are a bit of a pain, but for the most part they’re good fun to break up the repetitive nature of farming. If you couldn’t tell, I’m a little obsessed with these games. I kind of want to go through from the beginning and find an emulator for each system so I can play through the games in order of their release. It’d be super repetitive, sure, but I would probably have a lot of fun with it, and it’d be cool to see who the games improved and changed over time. There are also the spin-off games to talk about, and I’ll be bringing you more on that on Wednesday. Until then, you should check out Harvest Moon, any Harvest Moon. They’re all pretty wonderful.